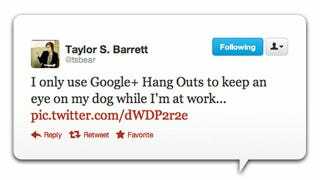 She'd never before used Google+ Hang Outs, but believed it would be the perfect program to serve as an ad-hoc puppy monitoring system. Before she left home, Taylor sent herself an "invite" to join the hangout, and once at the office, she "accepted" from her work computer. There, in her cubicle, the puppy appeared on her screen, curled in a nest of blankets. Instant puppy cam! "Because I had left the sound on when I left," Taylor explains, "she woke once my coworkers and I Ooohed and Aaaawed from the office. I had woken the baby!" So she turned off the mic on her office computer and let the tiny Chihuahua curl up and doze off. She lost the feed, shortly thereafter. "I thought I had accidentally exited the screen," Taylor says, "but apparently Google+ Hang Outs checks to see if you're still online after 90 minutes have elapsed and signs you out if you don't press 'I'm still here,' or something like that." Taylor looked into whether it's possibly to disable "check in" and, unfortunately, this is not an option. Now she's looking into modes of remotely controlling her home computer, so as to keep Google+ from signing out her dog. TeamViewer, a free-to-download program that connects to any PC or server around the world and allows you remote control access, will be her next step.